Following Kazuo Ohno's death on June 1st 2010, a public memorial service, Bravo, A Joyous Send-off for Kazuo Ohno took place on July 17th at BankART Studio NYK in Yokohama. 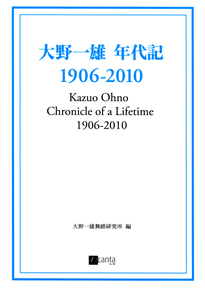 To mark the occasion, the Kazuo Ohno Studio compiled Kazuo Ohno 1906-2010: A Chronicle of a Lifetime. This publication features 15 colour as well as 48 black and white photographs from noted photographers such as William Klein and Eikoh Hosoe, along with illustrations, posters and other memorabilia from throughout Ohno's career . Seven distinctive commentaries cast light upon Kazuo Ohno; intimate messages from his sons Yoshito Ohno and Yukio Nagatani, an artistic appraisal from the Brazilian theatre director, Antunes Filho, along with a contribution from Kakuta Mitsuyo, an alumna of Yokohama's Soshin Baptist School where Ohno worked for 40 years. Set out in chronological order, this book offers the reader a rewarding historical insight into Ohno's distinguished career. All rights reserved. No part of this publication may be reproduced, stored in a retrieval system, or transmitted, in any form, or by any means, electronic, mechanical, photocopying, recording or otherwise without the express permission of Canta Co Ltd and the Kazuo Ohno Dance Studio.